Somewhat last minute I've come up with the idea of putting together a Valentine's Day Card + Candy Swap. How it will work is you will exchange cards and candy with 2 different people. The candy shouldn't be more than $5. I should admit that this is really just a scheme I've concocted so that those of us living far away from family (me) or without a significant other (me again) will get a special treat in the mail around Valentine's Day. If you're at all interested Email me or leave a comment. I'm so thrilled that designer Todd Oldham is the host of Bravo's new interior design competition "Top Design." "Top Design" is set to premiere on January 31st, following the season finale of "Top Chef" (despite my adoration of cooking shows I just could not get into this particular one) and then move to its regular 10pm timeslot the following Wednesday. The three other judges that have been chosen to critique each designer include Jonathan Adler (at the top of my favorite people list), Margaret Russell, Editor In Chief of ELLE DECOR Magazine, and interior designer Kelly Wearstler (she who designed the stunning Viceroy hotel in Palm Springs). The show will take 12 new interior designers, artists, and architects from around the country, stick them in a West Hollywood loft, and pit them against each other for challenges that will challenge their creativity, aesthetic sensibility, time management skills and patience. Also check out the Top Design fan site Top Design Fan Wiki, where you can discuss the show and find out more information about the host, judges and designers. I could just pass out from excitement over this new series. 1. Anything off of Fred Flare's Valentine's Day gift guide. 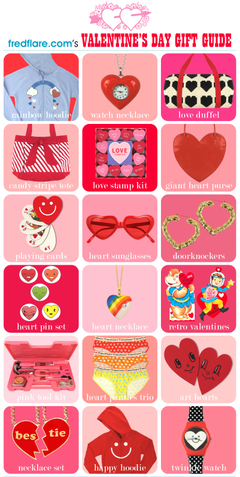 But I especially like the heart sunglasses, pink ladiez tool kit, and the doorganizer. Fred Flare is offering free shipping on all Valentine's Day items until Sunday (enter discount code "VALENTINES.0207" at checkout). Get shopping! 2. A pink iPod Nano with "Be Mine" engraved on the back. A seriously swoon worthy gift. 3. 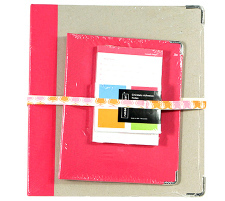 A Red Hot + Pink Set of binders and accessories from russell+hazel. 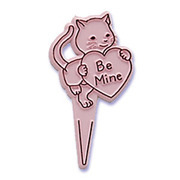 "Give your sweeties a valentine they'll savor long after February. It's a great way to say, "Baby, I like the way you work." 4. A red velvet heart cake from Williams-Sonoma. "Red velvet cake is a signature holiday dessert throughout the South, where it has been prized by generations of bakers. 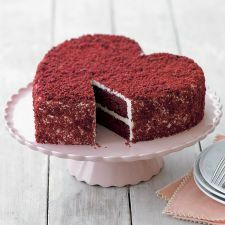 Distinguished by its scarlet hue, rich cocoa flavor and velvety, melt-in-your-mouth texture, this vintage cake makes a grand finale for Valentine's Day celebrations. Our heart-shaped version of the classic cake combines two luscious layers of rich, fudgy devil's food cake with fluffy vanilla buttercream frosting. From the perfect endings vintage cake collection, it is made using premium ingredients, following an old family recipe." 5. The book "I Like You". Either the Amy Sedaris version or the Sandol Stoddard version, it all depends on who the recipient of the gift will be. 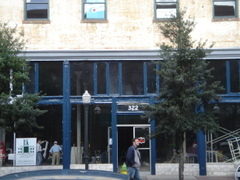 A few weeks ago I took one of my walks past the building on Broughton St. which will house the new Marc Jacobs store. Not much had changed since my last walk by aside from the exterior trim being painted blue. But I did get some juicy gossip from the shop girl employed at the store next door. 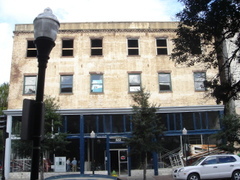 Apparently Marc Jacobs came to Savannah for a visit, became smitten with the city, and decided to not only open a shop here but to also purchase a home here. Now here's the most exciting part. The street he's decided to reside on is Jones St. Which just happens to be where I live. And the street is not that long by any means. So now instead of tracking the progress of the MJ store my time will now be spent trying to spot the man himself. Another bit of Jones St. gossip I heard not too long ago is that apparently the phrase "keeping up with the Joneses" originated right here in Savannah with Jones St. Which is one of the more attractive and historic streets in Savannah. Last Tuesday while watching Martha I was shocked to see Lori Marie of Pretty Little Things leading Martha in a craft demo. I've been reading Lori's journal for quite some time now. Lori is based out of Oakland and has a degree in fashion design from FIDM. She currently works as a "freelance textile artist for Pottery Barn Kids creating hand embroidery and applique designs for everything from pillows to bed skirts". On her recently opened online shop you can purchase items from her "pretty little things" collection. Included in the collection are a variety of darling handbags. "Each piece is hand cut from an original pattern so that no 2 are exactly alike. They are meant to be used and not just admired." Now back to how Lori Marie found herself on Martha Stewart's show. Apparently she was contacted by the producers of the show and asked to come up with a no sew craft project. 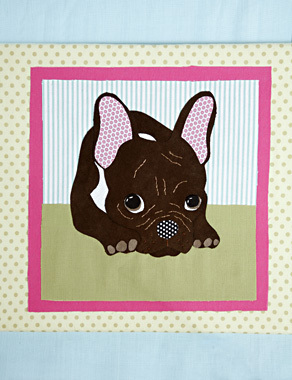 The selected project was a pet portrait of Lori's french bulldog Matilda. Lori handled herself like such a pro. She was even given two segments for her demo. Martha created her own pet portrait of her french bulldog Sharky alongside Lori. For those of you who missed the show there's a video tutorial and printed instructions of the project available on Martha's site. I cannot wait to attempt to make my own pet portrait of my cat Morrissey. If you are interested in a portrait of your own pet but aren't up to undertaking the craft project yourself Lori is taking custom portraits, which begin at $250.